If you haven’t checked into the dough ball craze yet, then now would be a great time to join in. I have a new flavor for you, and it rivals my long time favorite, chocolate chip. But, just what could possibly be better than the classic chocolate chip flavor, you ask? How about Sugar Cookie! 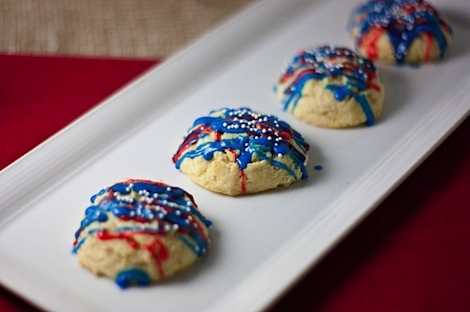 That’s right…Sugar Cookie Dough Balls! After making those patriotic cupcakes for the Fourth of July, I still wanted to make something else festive. Another easy dessert to decorate is the sugar cookie. Hubba hubba. 😉 But, I figured I’d do it TCL style with a play on the Chocolate Chip Cookie Dough Balls (inspired by the wonderful Annie the Baker). This version of the recipe uses my “new” method of scooping then freezing. If you prefer to chill, then scoop, check out the instructions at the end of this post or see this post for additional details. In a medium bowl, mix sugar and butter till creamy. (I used a handheld mixer, but you could probably just use a whisk). Add egg and vanilla and mix till combined. Mix wet into the dry. Note: it will appear there is not enough liquid for the amount of dry ingredients, but continue mixing. It will form into a dough, it will just be a firm dough. See tips on this post (click) for combining. Careful to not overmix. I’ve found pressing the back of a firm, medium/large spatula into the dough seems to work well. Pre-heat oven to 400 degrees F. Bake balls for 10-11 minutes, depending on how set you want your centers. If you use egg, and you’re paranoid like me, you can use a meat thermometer to ensure the centers of the balls are at least 160 degrees F, which many web sites say is the safe temp to eat eggs. Drizzle with frosting (see next recipe) and top with sprinkles, if using. This frosting can be made with milk for a more creamy texture, but make it with water so it can sit at room temperature for longer. Add food safe food coloring or gel dye to color frosting for specific party themes or holidays. Whisk powdered sugar and 1 teaspoon water together in a small bowl until combined. Add additional water in 1/4 teaspoon increments, whisking to combine each addition, until mixture is thick but liquidy enough to drizzle over cookies. Mmmmmmm…. these look delicious! And so pretty. Yummm! Thanks for the recipe! Sugar cookies may be my favorite cookie. I’ll be making these soon. i’ve had your dough balls on my ‘to make’ list FOREVER…and seeing this reminds me i need to get on that asap! these look fabulous! Once you go dough ball, you never go back! 😉 haha jk But they are really, really good! Which flavor do you want to make first? I’ve loved all your dough ball creations before so I will definitely be trying this one out too! 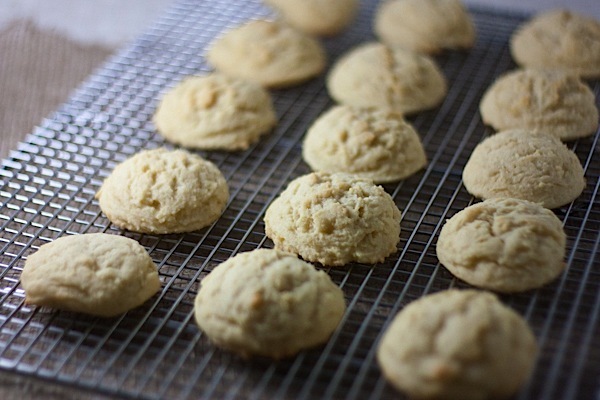 I have Snickerdoodles on my to-bake list! Well, Snickerdoodle dough balls, that is. What other frosting-y desserts do you like? Basically, you want to freeze them for between 1 hour and overnight. But, I’ve found they last a bit longer in the freezer if you want to have dough balls at your convenience! 😉 Mine didn’t last a week, though. I made these today and they are awesome! So soft and chewy — and the drizzle icing is so fun! I put in a little vanilla too and it turned out super delish. I made these today they turned out perfect thankyou!!! I’m making these this afternoon and just wondered if you could tell me approximately how many dough balls this will make… thanks!! Oh my goodness, so yummy!! I was able to get 24 out of this, which is perfect for the use I have. And confession time: I have the butterscotch oatmeal dough chilling in the fridge right now! Thanks so much, again! Oh nice! Glad to hear they turned out and made 24! Thank you, too! Have a great rest of the weekend! They’re both great! I find butterscotch chips too sweet for me but I’m sure these will be a hit. I think I might cook both types a little shorter (I went the full 14 min), as they seem to set up some more while cooling. Thanks again for sharing. Delicious! They definitely do set up as they cool. I like them best when they’re completely cooled or even the next day when they’re really set. It’s fun to play with the timing till they get to the texture you like. 🙂 Enjoy! I’ll for sure be playing with the sugar cookie dough. That seems to be my new fave cookie since I stopped eating chocolate (I went off all caffeine, including cocoa products). I’m proud of myself for not having devoured the whole batch… yet! BTW, I have your maple dijon baked tempeh bookmarked and plan to make it very soon. I’ll report back about that as well. Hope you like the tempeh! I have had carob but many years ago, and had never even thought of it as an alternative lately. I’ll have to look into it. Thanks so much for the helpful article! Sure thing, and thank YOU! I am so thankful I found your recipe! I don’t bake or cook well but I do enough to get buy for my family of 5. 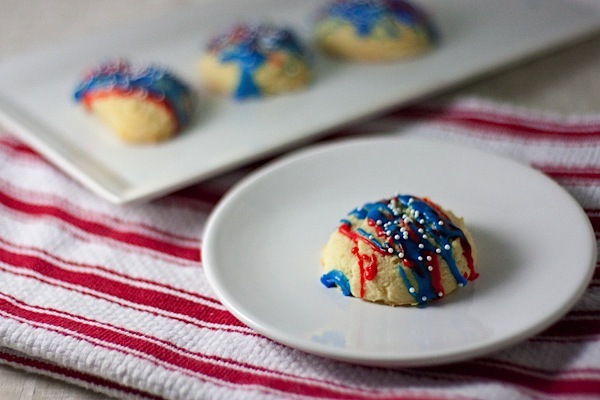 I usually bake with cookie mixes since I always felt like it was so much easier. However, when I actually took the time to look at the homemade cookie instructions I realized that a lot of the packages are only saving me 2 to 3 ingredients but costing me way more (wallet and health). So, I have been researching. I found your blog today and tried this recipe tonight. My 1st grader is celebrating St. Patrick’s Day early tomorrow so I added a drop of green food coloring to the dough and kneaded it with my hands gently until it mixed to a pretty mint green. They look beautiful and taste soooo yummy! I am having to force myself to send these to his school for their party. Thanks for all of your time and effort to get the recipe just right! 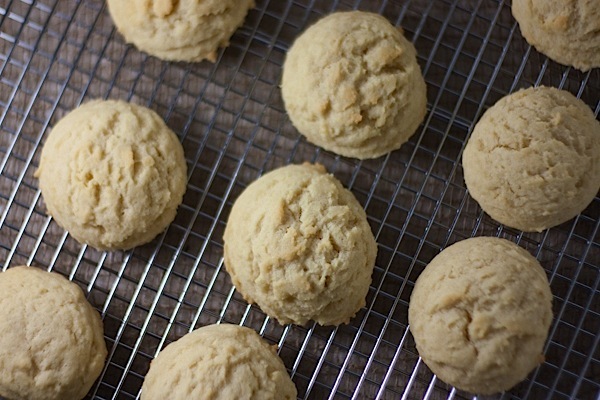 Those aren’t sugar cookie dough balls. I’ve made sugar cookie dough balls. They taste more like sugar bread.